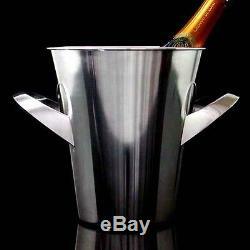 WMF High Style 1950s Mid Century silver plated ICE BUCKET Champagne Cooler WINE COOLER WILHELM WAGENFELD Era. Up for sale is this beautiful silver plated ice bucket in true BAUHAUS design. Made by WMF in the 1950s. The piece is in excellent condition with minor signs of use and age. It has been professionally polished and the surface is gleaming. Height 8.75 (22cm), diameter at top 7.9 (20cm). Do not hesitate to contact me for any further questions or details. The item "WMF Mid Century Silver Plate ICE BUCKET WINE COOLER 1950s WAGENFELD Era" is in sale since Thursday, June 4, 2015. This item is in the category "Collectibles\Barware\Ice Buckets". The seller is "lounge16" and is located in Köln. This item can be shipped worldwide.